How to copy DVD and Blu-ray collections to home server? Home » How to backup DVD and Blu-ray collections to home server? With Windows Home Server, you can store all your photos, movies, and more in a central location that can be accessed from any computer on your home network. And Windows Home Server uses a familiar interface that integrates with all your family's home PCs, making it even easier to find digital media. Everyone in your family can create and access shared folders of photo albums, music, and movies from any computer in your home network. You can also access music and other entertainment content through your Xbox 360 or digital media receiver. All of above explains why there be so many people set a home server in their houses. Have you ever thought that you can stream your Blu-ray and DVD movie library on TV through home server? Actually, once you rip your Blu-ray and DVD discs to home server, you can use your game console such as Xbox One to playback your media library. How to back up your DVD and Blu-ray disc collections to home server for playback with Xbox 360 or the new Xbox One S? Well, you need to rip the movies off the discs and convert them to more common video formats. 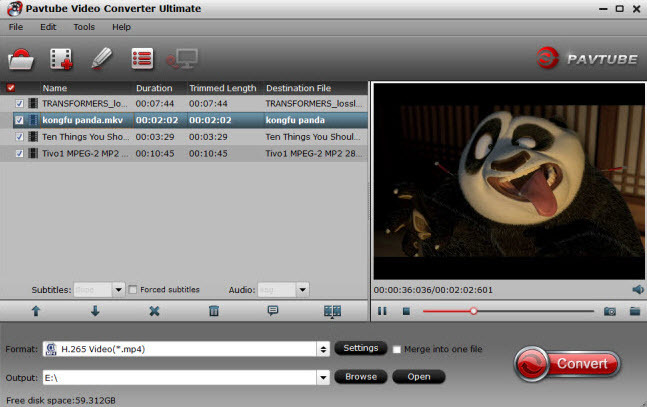 Pavtube Video Converter Ultimate is right what you need. It not only remove the protections of DVDs and Blu-ray discs, but also convert them to almost any popular video and audio format as easily as convert common videos. It is a 3-in-1 tool consisting of Video converter, DVD ripper and Blu-ray ripper. It will enable you to backup or rip BD movies, DVDs, and almost all kinds of videos to your home server according to your different demands. If you want to watch 3D Blu-ray on 3D TV via Home Server, Pavtube Video Converter Ultimate can help you rip 3D Blu-ray to 3D MKV/MP4 even convert 2D Blu-ray/DVD to 3D SBS video for 3D TVs or your HTC Vive and other VR Headsets. The following paragraphs will show you the detailed steps about the whole process; just feel free to get what you are looking for. How to Copy Blu-ray and DVD to Home Server? Step 1: Download, install and run Pavtube Blu-ray Video Converter Ultimate. Once run it, you can load your BD movies, DVD movies, via clicking or "Load DVD", or whatever video files via clicking "Add Video". Click the pull down menu of "Format" to select output format for your Home server. This program provides a wide range of output format profiles, and even "Directly Copy" is supported. If you don’t want to have any quality loss of your movies as well as do not mind the output file size, then this option is your best choice. Also, if you have some concerns on your storage space, then you can choose "HD Video" to both keep high definition quality and save your space. Meanwhile, you can click the folder icon at the end of "Output" to specify where to locate the output files. Tip: If you choose “Directly Copy”, the app will back up VOB and M2TS files form DVD and Blu-ray disc to your home server. You may play them with VLC player or KMPlayer. Click "Settings" button, and then you can adjust audio and video parameters like bit rate, frame rate, aspect ratio, audio channel, etc. in the following interface. 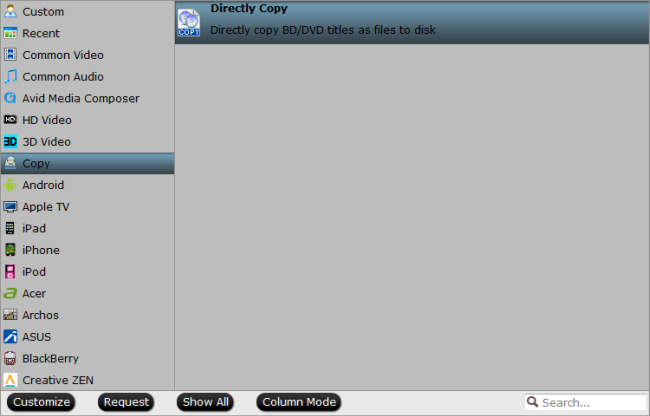 BTW, this option is unavailable when you have chosen "Directly Copy". Once finished, you can click "Open" button to find out the resulted files, now, you can backup them onto your home media server effortlessly. 1. Why this Video Converter is entitled Ultimate? Actually, it is a 3-in-one program, which has integrated a Blu-ray Ripper, a DVD Ripper and a Video Converter together as a standalone application. 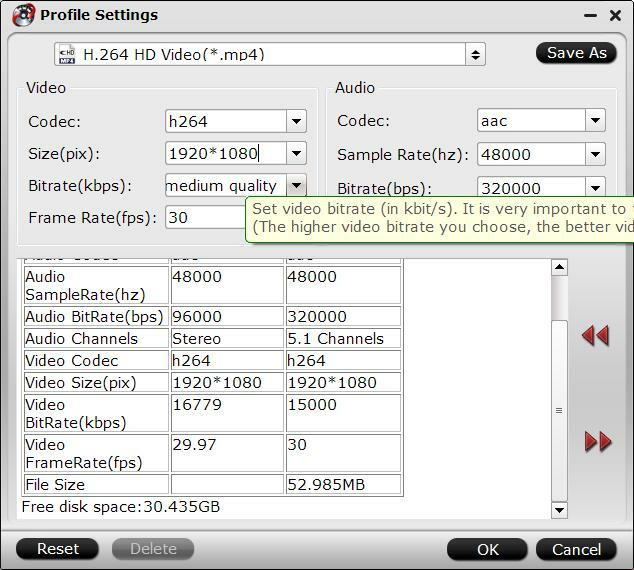 That means it can not only deal with Blu-ray discs and DVD discs, but also handle other video files in a wide range of formats, including *.avi,*.divx, *.wmv, *.wma, *.asf, *.dvr-ms, *.wav, dts in wav, *.rm, *.rmvb, *.ra, *.mov, *.qt, *.mp4, *.3gp, *.3g2, *.dv, *.m4b, *.m4v, *.m4a, *.aac, *.flv, *.f4v, *.dat, *.mpg, *.vob, *.mod, *.m2v, *.tod, and so on. With advanced audio technology, it is capable of reading all audio tracks of a BD disc, including Dolby TureHD Audio and DTS-HD Master Audio, which will never let you miss the mother tongue of the movie. The program adopts advanced audio and video sync technology to keep you free from out of sync issues.